Sticky notes may help you to remember chores or important tasks, but sticking them all over the place can be tiresome on the nerves especially if you are forgetful in the first place. If you find yourself using more than five pieces of sticky notes every day, perhaps the electronic alternative of the sticky pad will appeal to you. 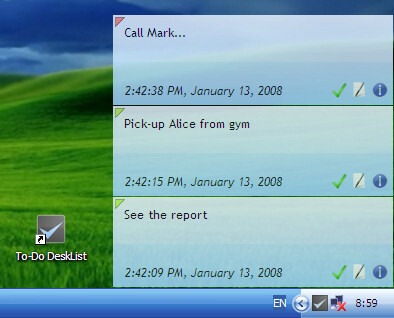 A Windows-based desktop application, To-Do-Desklist, can help you to organize and remember the list of things you have to do. To-Do-Desklist is a powerful and effective task management tool that helps users to record notes, important notes, appointments, reminders, etc. Compared to other task management utilities, the key advantage of this application is its simplicity. Users do not have to deal with a complex hierarchical structure. To-Do-Desklist features a simple and user friendly interface for users to key in important to-do lists or notes and prompt users when the time is due. Users can customize their preferred hotkeys for quick data entry and records display. Users can easily review all the pending tasks and mark them if the tasks have been completed. Users also can set priority on items of the to-do list and sort them according to priority or date. With applications like To-Do-Desklist, users can get things sorted and organized in a more efficient and faster way. Disasters like forgetting a wedding anniversary, buying birthday gifts, appointment to see the dentist, etc might not happen again.